Implemented in 2008, the LexisNexis CounselLink enterprise legal management system was originally configured to align with the PepsiCo law department’s business unitbased operations structure. After numerous complaints by internal staff relating to the processing of invoices, PepsiCo’s Director of Business Operations, Jerome Walters, recognized that the company’s CounselLink system needed to be realigned to reflect the changes that had occurred in the food and beverage giant’s organizational structure since the CounselLink implementation. It was clear to Walters that it was time to rethink how the law department was using CounselLink. With more than a half-dozen business units — each with four different practice areas beneath it — and 72 offices based on that same configuration, PepsiCo’s legal billing structure was overwhelming, to say the least. “Which made my workflows overwhelming,” Walters says. With daily calls about misrouted invoices taking up an increasing amount of his time, Walters knew that he needed to act. He was determined to solicit the best help he could, so Walters tracked down LexisNexis Professional Services consultant, Amy Choe, at the 2013 CounselLink Customer Conference. After a detailed briefing on PepsiCo’s situation, Choe suggested organizing workflow around the legal department’s functional structure versus business units and optimizing CounselLink to support that structure. Rather than focus on business units, she advised, restructuring to a practice area shared service model would streamline processes and increase billing efficiency and accuracy. The LexisNexis Professional Services team spent the next few months identifying PepsiCo’s specific data requirements and then fine-tuning the CounselLink configuration’s features, workflows, rule sets, fee structures and data fields to meet the company’s needs. They tested the new configuration in a nonproduction environment to work out any bugs, and then went live over a one-week dark period. As a result of the CounselLink restructuring, office count went from 72 to just 10. Legal department workflows were reduced from 40 to 8. The previously widespread admin functionality was restricted to only the users who needed it. The invoice approval process was streamlined, eliminating the need for an administrative assistant to review invoices. And user satisfaction levels shot through the roof. Achieving results like PepsiCo’s required a lot of heavy lifting. For starters, the LexisNexis Professional Services team conducted an exhaustive scoping process to determine exactly what Walters wanted to accomplish. Once the desired outcomes were enumerated, the team worked backwards to determine how to optimize CounselLink to achieve them. Because CounselLink had been configured originally to meet the needs of the PepsiCo law department’s prior structure, all of its historical matter data had to be manually re-mapped to conform to the new structure. That required numerous back and forth spreadsheetreview sessions between Choe and Walters to ensure that the data associated with old matters would migrate successfully to the appropriate new matter types. PepsiCo also took advantage of the opportunity to review fee structures so they could more easily accommodate alternative fee arrangements and to optimize rule sets to handle common issues such as firms billing for multiple timekeepers at a meeting that sometimes overlooked in the invoice approval process previously. Extensive review and re-configuration of PepsiCo’s workflows was included as part of the project to streamline invoice handling. The scoping process revealed that of PepsiCo’s more than 100 custom data fields, fewer than half were being used consistently. The unused fields were removed and the remainder were moved to a section where they are visible for older matters only. That change resulted in more focused and purposeful data collection, which greatly improved reporting. To the delight of its CounselLink users, PepsiCo took the opportunity provided by the reconfiguration process to also provide them with the Microsoft® Outlook® plug-in for CounselLink. This integration allowed users to access e-billing and matter management information directly through the Outlook application, drag and drop files from Outlook to CounselLink and eliminate the need for duplicate entry of calendar items in both CounselLink and Outlook. Following the reconfigured system’s go-live, Choe and Walters took to the road to train PepsiCo’s CounselLink users. With users changing roles or divisions and new personnel being added, a large number of the users had never received formal training on the CounselLink system, so getting them up to speed properly on the newly configured system was a priority. “The training made a huge difference in their overall satisfaction with the system,” Choe said. Eight months after the implementation of the optimized CounselLink system, the LexisNexis Strategic Consulting team conducted a focus group to determine how users felt about the new system. Users reported significant improvement in satisfaction with the system, thanks to more efficient invoice processing with fewer workflows, easier and more accurate reporting and the convenient access to CounselLink that the Outlook plug-in afforded. PepsiCo’s Configuration Optimization experience includes many elements that are unique to that organization, but the dynamics that prompted the reconfiguration are not. Change is an ongoing, inevitable process that over time will likely bump up against at least a few of the assumptions made when CounselLink (or any other Enterprise Legal Management system) is originally configured. Although PepsiCo’s experience represents an extreme case of change, even modest changes – organizational, operational or technology related – can lead to inefficiency and the inability to extract the kind of data-driven insights required to align a law department’s performance with corporate objectives. As shown in this case, a professionally implemented Configuration Optimization can adapt the system to address change successfully. PepsiCo, Inc. is an American multinational food and beverage corporation headquartered in Purchase, New York. It manufactures, markets and distributes snack foods, beverages and other products in more than 200 countries. With 22 iconic, billion-dollar food and beverage brands in its global portfolio, PepsiCo Inc. is North America’s largest food and beverage business by net revenue and the second largest in the world. Like any continually evolving business, PepsiCo has undergone numerous operational reorganizations throughout its 50-year history. A series of mergers, acquisitions and divestitures that took place after CounselLink’s initial implementation resulted in PepsiCo’s law department billing workflow, which had been originally structured around business units, no longer being aligned with its current organizational structure. 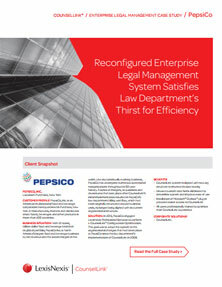 In 2013, PepsiCo engaged LexisNexis Professional Services to perform a CounselLink® Configuration Optimization. The goal was to adapt the system to the organizational changes that had taken place at PepsiCo since the law department’s implementation of CounselLink in 2008.